I have to admit it. For the price, I'd rather have a poor old baseball card than it's mint counterpart any day. Even though the primary goal of my collection is not monetary, I often wonder if my investment in these cards are worth it. That's why I've been concentrating lately on older, vintage cards. Goudeys, T205, T206, really any type of tobacco card, 1952 Topps, you know what I mean? I figure I can't go wrong as long as the cards hold a historical place in the hobby. This example set me back $4.25 + shipping. I'll take that deal any day. 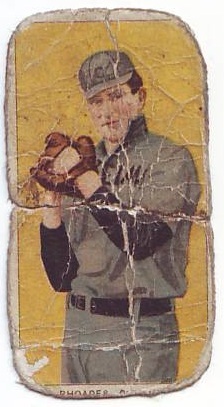 Bob Rhoades was at the end of his career when this card was printed. But a year earlier he did something very special: he threw the first no-hitter in Cleveland baseball history. A few weeks later, Addie Joss threw the team's first perfect game. One of the first things I do after unwrapping each card (most of my cards come via U.S. mail nowadays) is do a quick Wikipedia search. Sometimes you learn some pretty cool things about these old players.